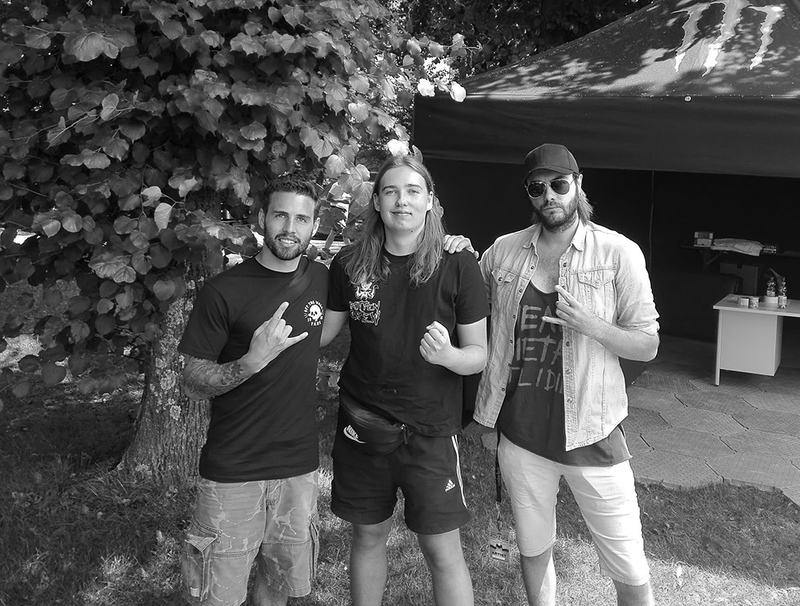 Before they took to the stage to open for Iron Maiden and Killswitch Engage at the Rockavaria Festival in Munich/Germany, THE RAVEN AGE’s George and Matt took some time to chat with our boss Felix about the life on tour, the future of TRA and how to start off a band! Hey guys, how are you, how’s the tour going so far? George: It’s been great so far. This is one of the first shows of this tour and we’re really looking forward to it. What’s the best thing about supporting IRON MAIDEN? George: I guess it’s like a challenge of trying to convert the fans over. I mean it’s such a loyal group of fans. They just wanna hear Maiden haha. It makes you nervous but it gives you fire. And after that you can watch the whole production which is pretty cool haha. Name your top 5 German Metal bands. Matt: That’s a tough one. George: Obviously Rammstein, I saw them a few times and the production is absolutely incredible! …Helloween of course. I saw them the other day at a festival. Matt: Helloween would be the #1 for me probably. George: Yeah, that was wicked. Matt: Honestly, I’ve never been into Rammstein, until I saw them live. I saw them live and I got it. You need to see them live on stage. I saw them at Download UK I think and to this day it was one of the most insane shows I’ve ever seen, it was unreal. It’s the same thing with Kiss. I’ve never been a Kiss fan, and then I saw Kiss live and I was like “aahh, I get it”. I also think it’s the same thing with Maiden. A lot of people don’t get it until they see it live. George: A few years ago I was really into the band Caliban. And Heaven Shall Burn, they were playing with Parkway Drive, that was really cool too. Matt: The problem is to know where the bands come from haha. George: What about you, what are your favourite German Metal bands Felix? Felix: Good question haha. 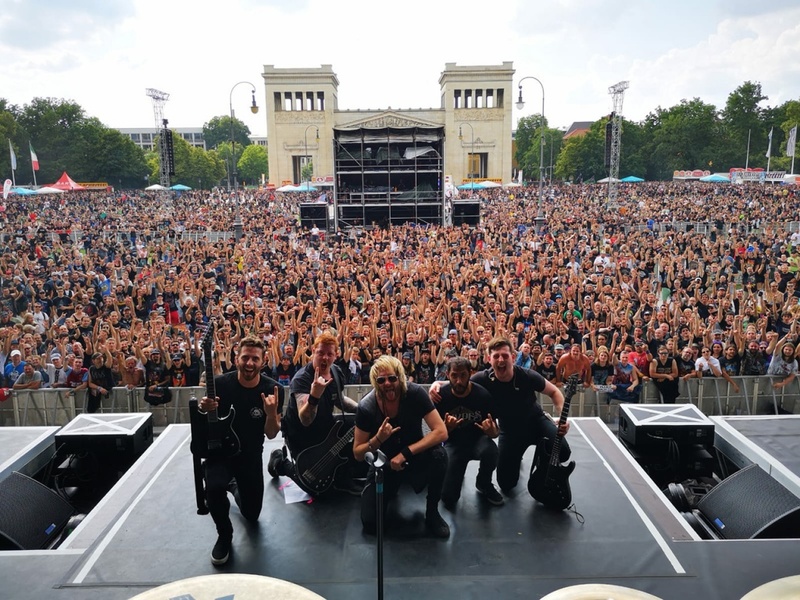 Of course Helloween, Rammstein…. Grave Digger, Kreator and maybe Accept. George: I think it’s a traditional english Sunday roast haha. Still have it every Sunday. Matt: For me, I’m a huge fan of asian cuisine. I love japanese food… sushi, that kind of stuff. George: That would be my #2 haha. What’s your favourite album of the year so far? Matt: Good question, I could tell you a lot from last year haha. George: I’m really into the new Parkway Drive album, it’s really cool. I watched the video of them at Rock am Ring of their new song Prey and it looked absolutely insane. I probably go with that at the moment. Matt: The new Five Finger Death Punch album is really good. From last year… I got really into Mastodon’s Emperor Of Sand, that was brilliant, and Avenged Sevenfold’s The Stage. But yeah, for me the main thing this year is Five Finger. What’s your personal summer anthem this year? George: The stuff we’re singing in the bus basically haha. But there’s one thing going round and round in my head. It’s this Sabaton tune. We met them a couple of times on the road. I don’t know the name of the song but it’s catchy haha. Matt: I have Holy Diver in my head haha. Because to this day I think it’s the best rock/metal cover ever done. Holy Diver by Killswitch Engage. Absolutely great. I love the original Dio track but I think they bring it to a completely different level. George: Hmmm, actually it’s Reverence by Parkway Drive. Matt: I think mine was the latest Mastodon album. What inspires you in the songwriting? George: I guess musically by loads of different bands, it’s everything. Matt: It could be everything that inspires you. You can get inspiration from absolutely everywhere. George: It can be one word that gets the ball rolling. Matt: The thing I have to be very careful with is that I can get obsessed by certain bands and I go like “I love this band” and that can take influence. Something you need to be very careful with. Have you got any advise for younger bands starting a band now? Matt: Don’t do it! Haha. George: The best thing you can do is being original, stick to your guns. Matt: You need to take a look to the big bands. You can’t put them in one category, they have a wide audience. Because they decided not to do just one thing. They do many things and they do all those things well. Don’t be a niche band. I hate niche bands by the way haha. Don’t work like ‘we can’t do this because it’s not our thing/our genre’. I would hate to be in a niche band haha. If you’re in a niche band you’re not creative anymore, your creativity is limited which is rubbish. But the main thing is: don’t do it for other people, do it for yourself! It should be fun, that’s why we do it. What are the future plans for TRA? George: Our plans at the moment are to release another album at the end of this year. It’s gonna be very very tight. Matt: We’re already trying to do everything we can to make shure that this will happen, but we’ll see haha. Great, that’s it for now haha. Thank you for your time again! George: Thank you for everything!